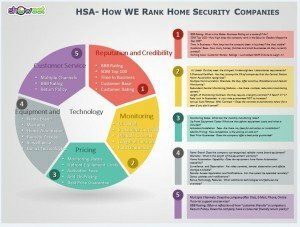 Our Home Security Company Comparison Chart, contrasts a number of system features that we feel reflect the most important considerations when evaluating the Top Home Security Companies. 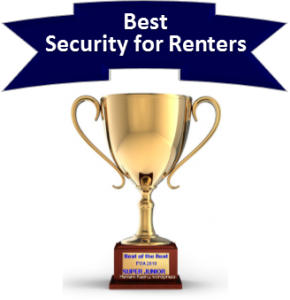 The Best Home Security Company–How to choose. While, we have selected Protect America as our #1 pick…your priorities in selecting a security company may differ. Any of our Top Alarm Companies are excellent alternatives. And while there are a number of factors to consider, it really boils down to…. All companies that we review offer reliable security systems with around the clock UL Listed monitoring services that meet the highest industry standards. In addition to standard intrusion monitoring, your system can be monitored for police, fire and emergency situations, flooding and carbon monoxide, depending on the equipment which you include in your protection package. Premium systems also may include cellular or internet monitoring options which enable you to utilize apps to monitor and control your system and any home automation features you have included in your system-from a computer, tablet or mobile device. Most security system include a basic starter package which will include your control panel and keypad, siren, emergency panic buttons, 2-3 door window contacts, a motion detector and perhaps a personal key fob or two. Our top ranked alarm companies have a wide variety of optional equipment available to meet your individual needs. Available devices typically include- glass break detectors, smoke and carbon monoxide detectors, flood and low temperature sensors and surveillance cameras. You will likely have to pay extra for many of these devices, although some companies allow you to incorporate these into your monitoring package. In the event of an emergency, the response time with your monitoring service is critical. Top alarm companies all offer UL Listed monitoring services to respond to threats and emergencies detected by your system. The best companies also offer customer support through e-mail, phone and live chat services for non-emergency service. While some companies require installation professionals to install and activate your system, some of our top-rated companies can monitor systems that you have purchased and installed yourself. Other important considerations are whether or not you can take the system with you when you move and the length of the equipment warranty. If you are looking for more in-depth reviews on our top home security companies, the following links will take you to each of the companies listed in our Best Home Security Companies Comparison Chart! Each of the reviews includes a summary, pros and cons, in-depth analysis in 5 categories, video summary, equipment descriptions and costs. There is even a section for detailed customer reviews! Thank you for visiting our site. Please feel free to leave your comments and feedback on our Home Security Company Comparison Chart, below. on it. I have mailed them a copy of the document she gave us and put a tracer on it but for some “strange” reason they claim they cannot find it. Then I emailed them a copy but they want more which we don’t have anything else. I feel they are unreliable and wouldn’t trust them. Sorry to hear of your difficulties with AMP Smart…you can leave a specific review on our page for AMP Reviews. Hopefully, you can resolve the issue, and will have a much better experience with one of the companies listed in our Home Security Comparison Chart above. Several years ago our security system was with a company called Monitronics (which had bought out Security Networks). After the switch was made, we made the mistake of trying their automatic payment plan. Over $200 in NSF charges and we could never get a straight or consistent answer even though they claimed they would reimburse us for those charges. We decided when we changed, it would be to a more reputable company. As we are USAA members, we checked their website and it looked like Protection 1 was a good company, so we switched to Protection 1 in July 2016. The people there have been very responsive and helpful with the few problems we have had – mostly how to change batteries. In January 2018, I read that ADT had bought them out. After contacting Protection 1, I received an email from their Customer Relations Admin assuring me that Protection 1 had bought ADT and that nothing would change. I called Protection 1 today and it was answered: “Protection 1 – now ADT”. I asked and was told it was a mutual merge. So what it the story? We do NOT wish to deal with ADT but it now looks like we will be forced to do so. When our contract is up, we are looking at Protect America. Great question, Mike. With all the mergers and acquisitions in the home security industry, it is sometimes difficult to stay abreast of what company you are ultimately dealing with. The private equity firm that owns Protection 1 also purchased ADT in 2017 and is merging the two companies, which will ultimately operate under the ADT brand. I am sure that many of our readers, who share your concerns with some of the uncertainties inherent in a merger of this size, will also be considering some of our top choices for best security companies such as Protect America and Frontpoint. We wish you the very best and thank you for sharing your thoughts. Have you done any research on the “AMP Smart” security system? I understand it is very highly rated. Yes…we did a review a while back. It didn’t make it into our Best Home Security Companies comparison list, but, you can get a full review here. Thank you. I found your website through a YouTube review you posted regarding Livewatch. Your website information was very helpful in making my decision to purchase the security system that I did. I was very surprised that Consumer Report did not review security systems, so I thank you again for your time. I am glad to hear that you found the information helpful. I hope that you will like/share your experience on our site and come back and share your experience with our readers about Livewatch Security once you have installed your security system. We are looking to include customer ratings to help future readers make informed decisions on which of our top home security systems best meet their needs. You have made a great decision to protect your home and family, and I am sure you will enjoy the convenience and peace of mind for years to come!